JoAnn Stratakos' mugs support a huge cause: protecting endangered animals. 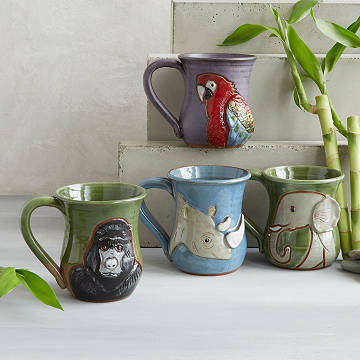 Potter and animal lover JoAnn Stratakos created this series of custom mugs just for us—and to help give endangered animals a fighting chance. She throws each one on her wheel, then hand carves each animal, giving them fantastic detail and texture. Dreaming of sipping coffee before going on safari? We just found your new favorite thing. Handmade from stoneware by JoAnn Stratakos and company in Effort, Pennsylvania. For every mug sold, we'll donate $5 to the Global Wildlife Conservation (or, for Rhino mugs, conservation advocates PARCA). Loved this gift as it was the perfect representation of two different personalities! Love this mug. You can tell it was handmade. I would buy this product again for sure! This mug is amazing! My friend cried when she opened it! My daughterr-inlaw LOVED her mug! My daughter was surprised and very happy. They are just perfect, I have been looking for special coffee mugs for my vacation home forever. These are perfect!